The resolution of litigation, whether by way of settlement or by judgment or award, invariably has taxation implications for the parties to the dispute, and often for their associates. Unfortunately, on many occasions, liability to tax is not considered until the completion of litigation. This article discusses generally some of the potential taxation consequences which legal practitioners should consider when assisting their clients and highlights the need for taxation advice to be sought, specific to the particular factual matrix of the litigation, in order to prevent unexpected liability to tax. Less than a decade after Australia and East Timor executed the Certain Maritime Arrangements in the Timor Sea (CMATS), a dispute has arisen over the maritime boundary and the rights to petroleum resources in the Timor Sea. 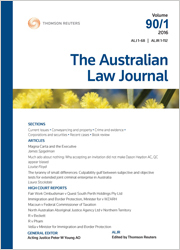 Following an overview of the development of the law of the sea, this article will analyse the arbitration proceedings commenced by Timor-Leste and the implications of Timor-Leste obtaining an order to set aside CMATS on the grounds that the treaty breaches Australia’s obligations of good faith. Regardless of its reasons for commencing the arbitration proceedings, Timor-Leste is in a much stronger position under CMATS than previous treaties with Australia. Timor-Leste stands to benefit from billions of dollars in revenue from its 50% share of the Greater Sunrise project, which in turn means that the advantages under the CMATS arrangements outweigh any perceived detriment from a lack of a definitive maritime boundary between the two states. Corporate law and its practice have unique features that impact upon the lawyer to client relationship and more generally, the legal profession. Further, public-listed company clients’ wealth and power enable them to exert influence upon their legal advisers. Transactional corporate lawyers may find their legal advice to these clients raises professional issues due to the nature of corporate law. In addition, clients often have conflicts of interest that could affect their instructions. These matters are examined as they may create ethical issues for corporate lawyers causing them to look to legal ethics for guidance. Yet perversely, lawyers’ professional legal ethics cannot always resolve ethical matters. These dilemmas may be a regular occurrence for transactional corporate lawyers. How are they, as professionals, meant to address them? For the PDF version of the table of contents, click here: ALJ Vol 92 No 8 Contents.